Summer is that time of year when we spend a great deal of time oudoors. When you are a kid, the days never seem to end. From morning to evening, it’s nothing but fun and endless activiities like BBQ’s, picnics, swimming pools, baseball games and playgrounds. However, it’s also the time of year when the sun is at its hottest and becomes potentially dangerous. Let’s face it, each summer seems to encounter record temperatures compared to the previous one and harmful UV rays have become a real concern. It’s no wonder that playground safety during the summer months has become a real concern for parents, camp conselors and school administrators. Below are 8 simple tips that offer helpful information on keeping your playground safe in summer. 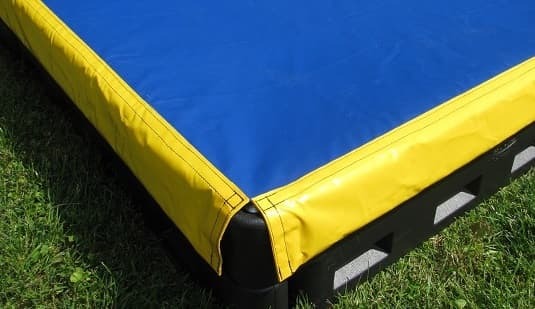 They’re based on the U.S. Consumer Product Safety Commission’s (CPSC) Public Playground Safety Handbook and our experience with ASTM F1487, the manufacturing standard that governs commercial playground equipment. 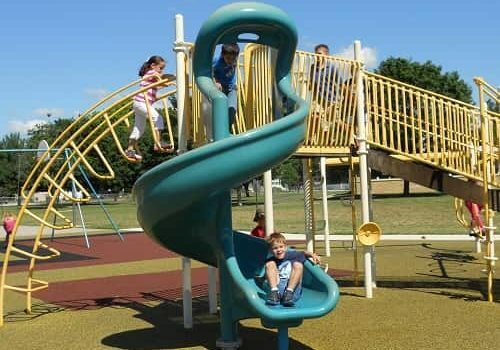 Most commercial play equipment is made from metal and plastic, two materials that conduct heat and retain it. “When exposed to direct sunlight they may reach temperatures high enough to cause serious contact burn injuries in a matter of seconds,” according to the CPSC Handbook Section 2.5.3. Swing seats, too, can heat up, as can swingset chains. Keep inmind that even playground surfacing gets hot, especially rubber mulch, rubber tiles, and Poured-in-Place unified surfacing. Before your kids get on the equipment, simply test the temperature with your hands and don’t let kids play on the surface barefoot. If you’re a playground operator, but unable to always supervise the area, consider posting a sign to the play area as a warning. If necessary, consider adding a shade structure to the play area to keep the temperatures down during the warmer months of the year. Excessive sunlight not only heats up playground equipment to dangerous temperatures, it can create long-term health problems for kids. To minimize sun exposure, the CPSC Handbook Section 2.1.1 recommends man-made structures and natural shade (i.e., trees) as ways to bring shade to your play area. 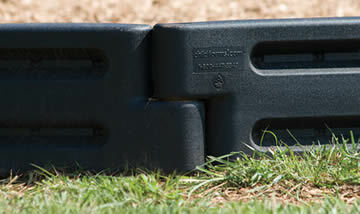 These can shield both kids and equipment. “Bare metal slides, platforms, and steps should be shaded or located out of direct sun,” according to the CPSC Handbook. It is always important that children have access to plenty of water when out during the hot summer months. Children can exert an incredible amount of energy in a short amount of time. Bring some ice cold water or frozen bottles of water out to the playground. While many playgrounds have a water fountain, they could be out of service at times.Hot weather makes people sweat. Kids don’t always know to keep drinking water like adults do. Whether it’s water fountain or bottled water, make sure that children have access to cold H2O before, during, and after they hit the playground. No matter how much shade is available on a playground, it’s impossible to block out the sun completely. Use plenty of sunscreen or sunblock to screen out harmful UV rays from above. Since most playgrounds do not have shade structures, it is important to keep children protected. During the peak of summer, sunburn can become an issue after only 30 minutes of exposure. It is also important to educate children about the importance of using sunblock and protecting their skin from sun exposure. The power of the sun is stronger than you would believe. When it’s focused on the joints of playground equipment for weeks on end, it can crack metal and plastic. You should inspect these items regularly for strength and surface texture. A good sign of measure and see if anything seems loose after giving it a tug. Just a few minutes of your time can go a long way to ensure that the playground is safe for use. 6. Look out for insects. In hot weather, bees and wasps can nest under and inside playground equipment. If you see insects on the playground, watch their flight path, to see where they go. If they’re building a nest on the play area, contact the playground operator immediately and, if necessary, remove the children from the play area. 7. Follow the weather forecasts. Summer storms can develop in on a few minutes notice. Keep track of weather forecasts to avoid sudden rain downpours and lightning. After a rain shower, check the playground to make sure that the surfacing levels have not been depleted. Also check playground structures to make sure that surfaces haven’t become slippery. 8. Contact a Certified Playground Safety Inspector (CPSI). Certified playground inspectors are trained in the official safety standards for playground equipment and surfacing. They’re the playground safety experts. We have 5 on our staff, and many more across the USA. For information about safety inspections in your area, phone us today at (877) 840-0707. We can refer you to a CPSI anywhere in the USA.